On 24 March 2010, at 0120 Atlantic Daylight Time, a Boeing 727-225 , Cargojet Airways flight CJT620 , departed Hamilton/John Munro International Airport, Ontario, on a scheduled cargo flight to the Greater Moncton International Airport, New Brunswick, with 3 crew members on board. An Instrument Landing System approach was carried out and at 0307, Cargojet Airways flight CJT620 touched down on the 6150 foot long Runway 06. Following touchdown, the flight crew of Cargojet Airways flight CJT620 were unable to stop the aircraft prior to the end of the runway. The aircraft came to rest in deep mud, the nose wheel approximately 340 feet beyond the runway end and 140 feet beyond the edge of the paved runway end strip. A local fire department responded and arrived on-scene approximately 20 minutes after the aircraft departed the runway. The flight crew exited the aircraft using a ladder provided by the fire fighters : there were no injuries and the aircraft had minor damage. The Cargojet Airways flight CJT620 touched down between 2000 and 2500 feet from the threshold and at a higher than required airspeed, which significantly increased the required runway length to safely stop the aircraft. The presence of standing water on the runway caused the aircraft to hydroplane, which led to a loss of directional control and braking ability, significantly increasing the required stopping distance. The reduction of reverse thrust following touchdown to realign with the runway centreline, in accordance with the manufacturer’s recommended practice, increased the aircraft’s required stopping distance. The decision to carry out a pilot-flown-approach, rather than a pilot-monitored approach, at night, in heavy rain, likely contributed to the aircraft’s higher than required airspeed that was maintained until touchdown. 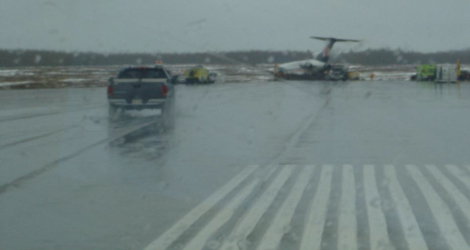 The combination of delayed touchdown point, higher than required touchdown speed, and standing water on the runway prevented the aircraft from stopping within the available landing distance. 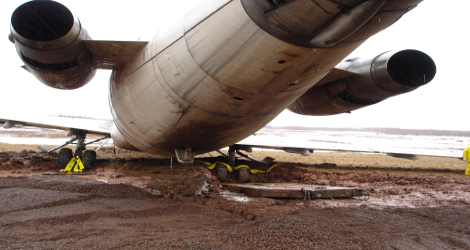 As a result, the aircraft overran the runway, coming to rest in deep mud.